At Beeradvocate, Jalapeno Imperial IPA has a score of 86. Over at ratebeer, it has an 89 overall with a 95 for style. The Alaskan Pilot Series showcases the boundless creativity of the Alaskan Brew Crew through a rotating collection of big, bold and distinctive brews packaged in 22 oz bottles. Each new recipe is first perfected in our 10-barrel pilot brewhouse, then tested through our Rough Draft series of draft-only beers. Those special brews that fly beyond expectations ascend to a limited release in the Alaskan Pilot Series. The specialty beers in our Pilot Series are available in limited quantities throughout the states where Alaskan beers are sold. Because this is a rotating collection, we recommend trying our Pilot Series brews soon after their release date - they may not be around for long! The American Imperial IPA style was developed and made popular by west coast American breweries seeking to create a highly intense drinking experience. The style is most often characterized by a gold or copper color, citrus hop character, big malt body and lingering bitterness. The addition of jalapeño peppers lends itself to furthering this intensity, while effortlessly pairing with the style’s hop profile. This Jalapeño Imperial IPA is fresh from the onset, with a quartet of bright hops playing off zesty jalapeño heat. A lustrous head retains the citrusy combination of Centennial, Sterling, Magnum and Apollo hops. Fresh jalapeños are used not only during brewing, but also after fermentation for a pleasant aroma, full-bodied flavor and genuine picante kick. A sweet bready malt backbone provides balance to the peppery fire. Alaskan brewers set out on a quest to brew up a hop-forward beer with a smooth malt body and just enough heat to stave off the cold of an Alaskan winter. In the spirit of exploration, and as a challenge to their skill, they sought to maximize the flavor of jalapeño. The result is a well-balanced beer that showcases not just the volcanic power of the jalapeño pepper, but also its flavor and aroma. Alaskan Jalapeno Imperial IPA is made from glacier-fed water, the finest quality Centennial, Sterling, Magnum, and Apollo hops, premium two-row and specialty malts, and a whole lot of fresh jalapeños. A complex hop build and jalapeño kick make this beer a perfect pairing for pub fare, such as fish and chips and cheeseburgers. Rich foods like red meats and cheeses will pull out the malty characteristics, but ultimately South and Central American food is the partner this brew was born to tango with. Forming the Northern part of the seismically-active Pacific “Ring of Fire,” the Alaska Peninsula and Aleutian Islands are home to dozens of active volcanoes, making up over three quarters of the volcanoes that have erupted in the past 200 years in the U.S. The largest 20th century explosion on earth occurred here, the 1912 eruption of Novarupta and Katmai, which formed the Valley of Ten Thousand Smokes. While Alaska is often thought of as a cold place, this unexpected heat is also a part of who we are, and the jalapeño heat in this double IPA provides a reminder that you may be surprised by what you find in Alaska. The volcano pictured on our label is Augustine, named by Captain Cook in 1778, which is the most active of the eastern Aleutian volcanoes and is often seen letting off steam in Cook Inlet. Alaskan Jalapeno Imperial IPA pours a brilliantly clear copper with a thick creamy white head that holds moderate retention and leaves intricate lacing behind in the glass. This is a gorgeous beer to look at but no one ever pours a beer with the intention of staring at it, so moving on… Mild citrus hops immediately come to the forefront on this beer, with notes of bready and caramel malts. Fresh, green jalapeno comes in just behind the hops and malt. The spicy jalapeno carries through to the finish with a hint of orange. The aroma is pleasantly complex, an excellent combination of citrusy hops, and spicy peppers. Bready malts and orange citrus hops come to the forefront in the flavor with a dose of fresh green jalapenos rounding out the hops. Lingering citrus and jalapeno carry throughout the flavor and linger long after the last sip. The jalapeno is only moderately spicy, but the combination of the spicy jalapeno, orangey citrus hops and bready malts work well together. Jalapeno Imperial IPA is moderately malty with a moderately high level of hop bitterness. It is medium bodied with a moderately high level of carbonation. 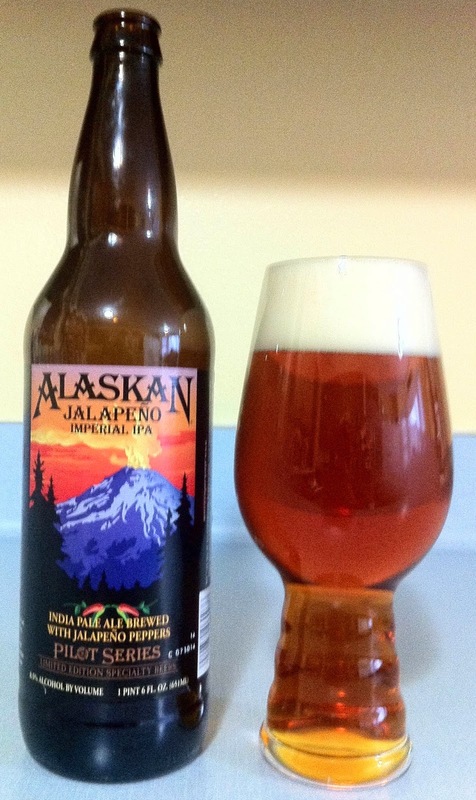 Alaskan Brewing Company’s Jalapeno Imperial IPA is a great beer! Going into this, I didn’t think that Jalapenos would work well in an IPA because hop bitterness enhances spice, so I thought one would overwhelm the other. Fortunately though, the spice is subtle enough, and the bitterness is smooth enough that the two do not interfere with each other. The citrusy hops, bready malts, and jalapenos all work together excellently in this beer, although I find myself wishing there was a more heat. That doesn’t highlight a deficiency with the beer more than just a personal preference on my part. In fact, it’s probably better that the spice isn’t more pronounced because the subtle spicing will get more people to enjoy this beer and go back for a second bottle. If you are new to spicy beers, pick this one up, it will be an excellent introduction to the joys of brewing with peppers. I know I will be picking up a few more bottles the next time I see Jalapeno Imperial IPA on a shelf and isn’t that really the best thing anyone can say about a great beer? That’s all for today, check back soon for the next post!